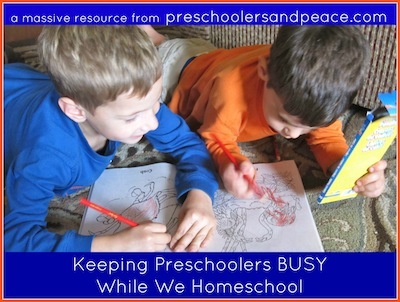 In the spirit of Preschoolers and Peace,revisiting the topic of keeping little ones busy while we homeschool really ought to be a regular thing. So when Sprittibee's post about how she does so in her home went up, I knew I had to point you toward it. She humbly replied that her ideas came from here, but I'm tellin' ya, her post far surpasses anything I've gathered in one spot, and you just can't miss it! How Do I Keep My Preschooler Busy? What Can a Two-Year-Old Do While We're Homeschooling? Can I Get Anything Done With a Lot of Little People? Troubleshooting: How Do I Keep Them Busy?